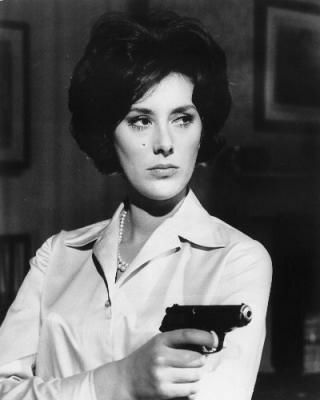 Sue Lloyd (7 August 1939 – 20 October, 2011) was an English model turned actress with numerous film and television credits. The daughter of a GP, Susan Margery Jeaffreson Lloyd was born in Aldeburgh, Suffolk. She attended Edgbaston High School in Birmingham and studied dance as a child, attending Sadler’s Wells Ballet School. As her height (5ft 8in (1.73 m)) increased, her possibilities for a career as a dancer diminished, and she became a showgirl and model, and, briefly, a member of Lionel Blair‘s dance troupe. She was one of the last two debutantes to be presented to the Queen at Buckingham Palace in 1958; the final such ceremony . In the same year Lloyd played the regular role of secret agent Cordelia Winfield, alongside Steve Forrest in the 1965-66 British ITC television series The Baron. Originally Lloyd’s character only appered in the pilot episode with Steve Forrest’s sidekick played by Paul Ferris. Pressure from the American television network who were to screen the show replaced Ferris with the glamourous Lloyd. In 1971, Lloyd starred in a stage version of the TV series The Avengers playing John Steed’s sidekick, Mrs Hannah Wild. She also appeared with several other stars in the 1976 Lindsay Shonteff imitation James Bond film No. 1 of the Secret Service. She made many guest appearances on several popular shows of the 1960s and 1970s including The Saint, Department S, Jason King, Randall and Hopkirk (Deceased), The Persuaders! and The Sweeney. She is probably best known, however, for her long-running role as Barbara Hunter, née Brady, in the soap opera Crossroads, beginning in 1975, and she remained in the role until 1985 when Sue and her on-screen and future real-life husband, Ronald Allen, were sacked from the series. To the surprise of many (he had lived with Brian Hankins for most of his life until Hankins’s death from cancer), she married Allen, six weeks before his death from cancer on 19 June 1991. Almost by coincidence I have been updating this blog with the latest series The Baron which starred more often than not Sue Lloyd. I am sad to realise that another wonderful star of the ITC era has passed away. At 72, Sue has lasted longer than most actors from this era but it is still a day of sadness. She also is in one of my favourite movies of all time “Revenge of the Pink Panther“.